Jan 10, 2014 The Brooklyn Museum invited Brooklyn For Peace to present a perspective --- a discussion on our organization's view of war, relating it to the museum's current exhibition, War/Photography: Images of Armed Conflict and its Aftermath. Using poetry, spoken word, music, video and slides, the presentation was attended by a room full of museum goers, many of whom were new to our organization. Touching on War At Home, War Abroad and War on the Planet, the conversation touched on questions of lopsided spending priorities in Washington that overwhelmingly favor the Pentagon over human needs. A fact-filled discussion on the new face of robotized warfare through the use of drones was presented as well as a section on the effects of war in the destruction of the planet's environement. The audience was invited to participate in all the discussions. It was an impressive production and the BFP "Players" pledged to carry the show to other venues in the months ahead. The museum's War Photography exhibit runs through February 2, 2014. Highly recommended. Here are some photos and videos of the day's event. Press PLAY ► (above) to see a short video. 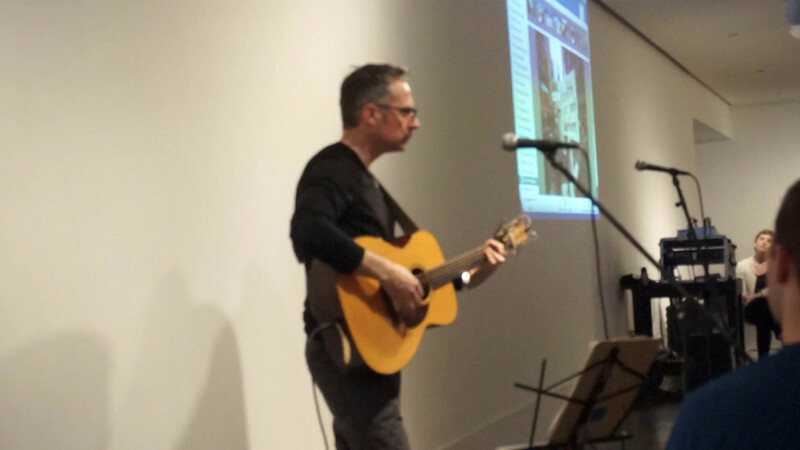 Singer-Songwriter John Munnelly captivated the audience with his songs of peace and love.